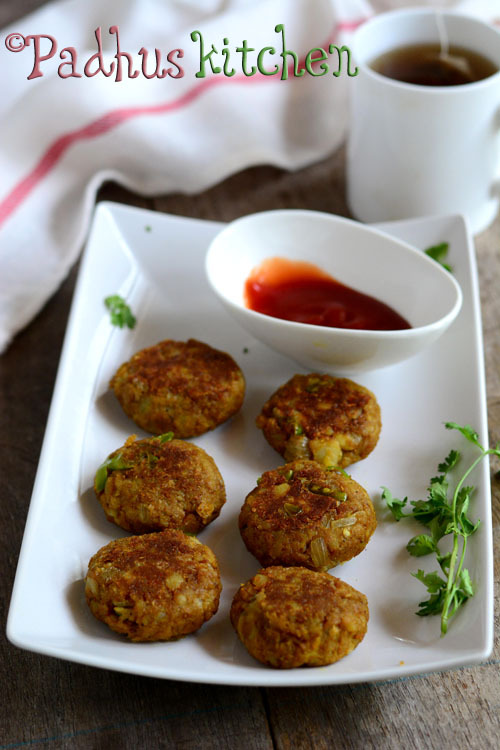 Soya keema cutlets or soya chunks cutlets are easy to make, good for any time of the day. They are healthy, nutritious and delicious. This is also a great after school snacks for school going kids. Today we will learn how to make soya nuggets cutlets following this easy recipe with step wise pictures. Bring water to boil with a little salt. When water starts boiling, add the soya chunks and switch off the heat. Let it be in hot water for 15-20 minutes. Then drain the water completely, rinse it 2-3 times and squeeze out all the water from the soya chunks. Grind it coarsely and keep it aside. Boil potato, peel the skin, mash or grate it and keep it aside. Heat oil in a pan, add finely chopped onions. Saute until onions turn transparent. Add ginger garlic paste and finely chopped green chillies. Saute until the raw flavor of the ginger garlic paste goes. Add the ground soya chunks, all the spice powder mentioned under "Spice Powder" and salt needed. You may adjust spices according to your taste. Saute until all the water evaporates and the mixture becomes dry. Then add grated boiled potato and finely chopped coriander leaves. Mix well and cook for another 2-3 seconds. Add bread crumbs and mix well. Remove from heat and allow the mixture to cool down. Divide the mixture into equal parts. Make balls out of the mixture and then flatten it to form patties. If you are unable to make balls, add more bread crumbs to the mixture. Heat oil in a pan and shallow fry the patties on low heat, both sides until golden brown. You can deep fry it, if preferred. You can also make balls from the mixture and deep fry it to make soya keema balls. Enjoy it hot from the pan with ginger cardamom tea or South Indian filter coffee or any coffee. Do try this out and share your feedback. Don’t forget to hit the +1, Share button, Tweet button, Pin it button, if you like the post. You can follow us on Google Plus, Pinterest, Twitter, Facebook and Subscribe to RSS Feed to receive latest updates. I tried this on Sunday, it really came out very well. Tasted yummy ☺all my family members liked it very much. Looks yummy and mouth watering. Shall try this weekend for my kids and let you know. Thanks for a great recipe. Made the cutlets (cauliflower was a great addition) and served as a burger with the fixings.Was much appreciated.Thank you.